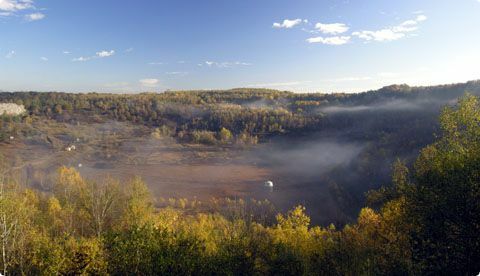 The Messel Shale Pit, (a former quarry! 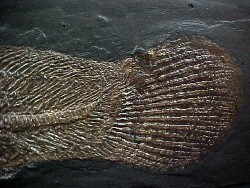 ), near Darmstadt, and some 35 km southeast of Frankfurt am Main, Germany, is widely famous for its regular yield of interesting fossils, (including those of a crocodile, mini-horses, bats, a possible anteater and a tapir), - famous enough to have been declared a World Heritage Site by UNESCO in December, 1995. The extraordinary fossils found at the Messel Pit have been dated to the so-called Eocene age which lasted from 54 million to 37.5 million years ago. The many millions of years of the Earth's existence have been divided, for reference purposes, into Eras, Periods and Ages, and in these terms the Eocene Age is part of the Tertiary Period and of the Cenozoic Era. More interestingly, perhaps, the Greek derived word Eocene translates as "New Dawn" and paleontology recognises the Eocene as being the age of the first large land mammals. The Messel Shale Pit seems to have been the site of a deep lake some 1.5km² in surface area during the Eocene at which time the Earth's climate was warmer - furthermore it is also believed that since the Eocene the - German - lands which now feature Messel, Darmstadt, and Franfurt have "continentally drifted" all of 10o of latitude northwards. The shales in the Messel Pit are oily shales probably as a result of heavy algal presence in a lake then bounded by lush sub-tropical vegetation. Billions of green algae called Tetraedron minimum would have lived their brief lives, expired, and join their billions of remains to those many many billions already deposited further accumulating, along with muds, clays and rotting vegetation, a bituminous deposit on the base of the lake. The lake seems to have been within a volcanic crater and thus replenished more by ground water and rain than potentially oxygen-bearing inflows from streams or rivers. For much of the time, the surface layers of the lake were a hospitable place for fish, turtles, crocodiles, insects and many other creatures to inhabit. The lower levels were however oxygen poor largely due to the prodigious presence of dead Algae allowing the remains of deceased animals to slowly fossilise through the assistance of bacteria moulding or casting the tissues that would normally decay away without being more radically disturbed by such bioturbations as would otherwise have resulted from scavenging by fish or other larger aquatic life. The bodies of any larger life forms that happened to expire into the the lake would have been preserved for fossilisation in the anoxic conditions, or a marked lack of oxygen, associated with the prodigious presence of decaying algae. Apart from routine fatalities geologists also consider it possible that giant belchings forth of toxic volcanic gases perhaps released by tectonic activity could, from time to time, have also induced fatalities, as a result of gaseous poisonings or suffocations, of various species living near the lake, or flying over it, whose remains would then become amazingly well preserved in the anoxic bed of the lake. During its years of service as a quarry many fossils were discovered, including the famous early (1875) instance of a fossil crocodile, and found their way to museums but by the 1960's other, artificial, materials competed for the market for tars and paraffin once claimed by materials processed from the Messel Pit. The quarry fell gradually into disuse at a time when its floor was already some 60m below the adjacent lands. The sedimentary formation has since been found to be more than 200 metres thick at the center of the deposit, and this is held to represent over one million years of accumulated deposition that principally took place some forty-eight million years ago in the middle Eocene. Believe it or not the Messel Pit almost ended up as a landfill for the dumping of waste! It was formally proposed, in 1971, that the then largely disused pit should be brought into service by local governing authorities as a "well managed" dump - the locals protested however and were supported in this by German and International scientists concerned about the possible loss of an unique source of Eocene fossils - even so an approach road was constructed in preparation for the proposed new role. Many fossils had been found during the decades the pit was mined for its tarry shales. The disuse of the site was followed by organised attempts by local museum authorities to discourage amateur fossil collectors accessing the site and digging fossils in the hope of making profits from their sale. Many, and truly amazing, successes followed as special transfer-preparation methods were developed to protect the fossils from decay in the fragile and readily disintegrating oil shale and preserve them permanently. The Messel Pit actually lies somewhat below the adjacent land and blocks of oil shale recovered from it often contain 40%+ water. It has been found that exposure to air can be followed by rapid drying-out and the crumbling of the rock and of the fossils contained therein. It is necessary for specimens to be stored in cool, damp conditions and for transfer to resin, (where the fossil is freed from the shale using needles and scrapers and colourless, transparent resin is built up in thin layers), to take place promptly. Given the state of preservation evidenced by many fossils that had been engulfed millions of years ago in oxygen-poor and bituminous deposits, the museums and other academic fossil collectors became seriously interested and the proposed development of the site as a dump began to become increasingly discredited. In 1991 the Bundesland of Hessen bought the site for 35 million marks, and authorised the Senckenberg Museum, Frankfurt, to co-ordinate further excavations. An amnesty was declared in 1997 allowing fossils, collected irregularly previously to 1995, to be brought into the light of day, and potentially into the interested attention of scientists. When fifty-million-year-old vertebrate fossils are found elsewhere they are usually teeth and scraps of bone and complete skeletons are great rarities. At the Messel Pit fossil quality is often of a very high order. The anoxic conditions resulted in the absence of "bioturbation" or vigourous feeding on the remains of deceased animals, birds, or fish, by anything more powerful or disruptive than algae and bacteria. Thus complete bony skeletons are available. Uniquely important however in the particular fossilisation process is the apparent detail available of flesh, fur and feathers left as algae and bacteria fed on organic materials but left outlines of what they had consumed - what ends up being fossilised is, in fact, the wastes excreted by bacteria that leave a detailed shadow in the shape of the soft parts they were devouring. These excreted wastes included respiratory carbon dioxide which became mineralised through reaction with iron in the lake to form iron carbonate, also known as siderite. The siderite built up forming a thin layer over the groups of feeding bacteria coating the hair and feathers. The coating of siderite proved fatal to the bacteria, effectively encasing each hair and feather in its own individual covering of black iron-based salt. from nose to tail, weighing only two to four kilograms. With some specimens, the bodies are surrounded by a so called Hautschatten ('skin shadow'). This dark area preserves impressions of plumage on birds and the individual hairs of mammals. The wing membranes and details of external ears are known from bats. Stomach contents have also been fossilised in some cases allowing for detailed insight to be gained concerning the diet of fossilised fish and mammals. A 50 million years old pygmy horse, with a shoulder height of 30 cm (or 12 inches), from Messel (taxonomic name: Propalaeotherium parvulum) with fossil stomach content (black) and preserved body outline (known as a skin shadow). The detailed examination of the stomach contents showed that this particular "early horse" ate the leaves of deciduous trees and also ate fruit. As of early 2009 scientists have identified 31 types of plant fossil, 45 species of mammal and 43 species of bird – some so swiftly fossilised and so long undisturbed that even colour and the smallest pattern of feather can be detected – as well as more than a thousand fish. These fossil remains include eight species of crocodile, some sixty pygmy horses some of which were pregnant mares and foals, more than 1,000 bats, insects with the colours on their wings still visible and the largest ant species ever recorded with their queens being some 2.5cm long and having a 15cm wingspan. Adapids, or the Adapidae, are a now extinct family of lemur-like creatures related to early primates. Early primates are known of from fossil discoveries that have allowed scientists to depict them as being probably nocturnal, because of their large eye sockets, and probably forest dwellers because of their long limbs which were deemed suitable for leaping from branch to branch and balancing whilst walking along branches. From May, 2009, the Messel Shale Pit and its fossils hit the headlines again with the announcement of the discovery of the fossil of a lemur-like, but also monkey-like, "intermediate" species from the Adapid family that has been given the scientific name Darwinius masillae and the nick-name Ida after the daughter of Dr. Jørn H. Hurum, one of the leading figures in the study of this fossil. The new Darwinius masillae / Ida fossil discovery from Messel Pit is that of a nearly complete fossil of a young female "lemur-monkey" from the Adapid family allowing paleontologists to gain important new insights into the Adapids and their place in evolution in relation to lemurs and to other primates. The academic paper accompanying the announcement of the discovery of Ida / Darwinius masillae is available online from the Public Library of Science web site Full citation details here. whose flower and fruitage is the world..."
"bundles of relations and knots of roots"
give rise to the "World" of Human Societies!!! 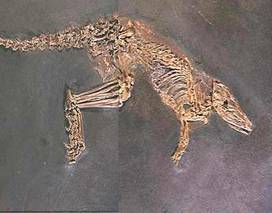 Complete Primate Skeleton from the Middle Eocene of Messel in Germany: Morphology and Paleobiology.